Professor John Pemberton has written a history of the early years of the Society. We would like to thank the editors of the Journal of Epidemiology and Community Health for granting Professor Pemberton permission to reproduce the article here for the benefit of our members (J Pemberton Origins and early history of the Society for Social Medicine in the UK and Ireland. J. Epidemiol. Community Health, May 2002; 56: 342 – 346.). In most British medical schools, at this time, there were courses of lectures in Public Health, usually given by a local Medical Officer of Health. They concentrated on the detailed law relating to sanitation, the epidemiology of infectious diseases in the UK and the administration of health services provided by the Local Health Authorities. Most medical students found these lectures tedious and not relevant to the diseases they were studying in the hospital wards. We knew little about the work of the MOH and he had nothing like the influence on them of the consultant physicians and surgeons of the teaching hospitals, the “honoraries”, whom we admired and held in awe. In a decade in which the number of unemployed exceeded three million, when unemployed men took part in “hunger marches” from the North of England to the Houses of Parliament carrying banners saying “We march against starvation” it is remarkable that the medical profession, with a few exceptions, was not more concerned about the effects of poverty on health. John (later Lord) Boyd Orr was one doctor who was concerned and who made his voice beard on the radio and in his classic book Food, Health and Income published in 1936. (1) In this he reported a survey which showed that a large proportion of the population was not getting enough food for health and growth. The Socialist Medical Association (SMA), founded by a few doctors in 1930, was another medical-political group whose members recognised the close relationship between poverty and ill-health and the importance of political decisions for changing these conditions. The SMA promoted, within the Labour Party, the idea of a comprehensive health service, free at the time of use. It was responsible for much of the thinking underlying the National Health Service which was introduced by the Labour Government in 1948 (4). Several members of the SMA became founder members of the Society for Social Medicine including Richard Doll, Horace Joules and myself. The appointment by Oxford University of John Ryle, professor of Physic at Cambridge and consultant physician at Guy’s hospital, to the first chair of Social Medicine in the UK in 1943 provided a great stimulus to social medicine as an academic discipline. Ryle put forward the idea that certain population groups were prone to certain diseases because of the conditions under which they lived. He called this social pathology and regarded government statistical reports on mortality as “good bedside reading”. Other universities soon followed Oxford’s example. Edinburgh appointed F A E Crew3 a professor of animal genetics, to a chair of Public Health and Social Medicine in 1944 and Birmingham appointed Tom McKeown, a research worker on air raid casualties, to the new chair of Social Medicine in 1945. Soon after, Trinity College, Dublin, appointed a professor of biochemistry, W J E Jessop to its chair of social medicine. London University was slow to follow. These early appointments, which did not include anyone trained in Public Health indicate that the universities were seeking candidates with experience and interests outside the traditional field of Public Health. In the 1940s social medicine was mainly thought of in terms of the importance of social conditions in relation to clinical disease. Epidemiology was still considered by most doctors to be the study of epidemics of infectious fevers. The term was not used, as we use it today, to include the study of the distribution of non-communicable conditions. Epidemiological research and its extension to non-communicable disease. Austin Bradford Hill (1897-1991), professor of Medical Statistics at the London School of Hygiene and Tropical Medicine (LSHTM), and a remarkable group of research workers influenced by him, (Appendix 1), played an important part in the extension of epidemiology in the UK to non-communicable disease in the years following the end of the 1939-45 war. Richard Doll, working with Hill, embarked on his seminal research on cancer of the lung and smoking. J N (Jerry) Morris became director of the new Medical Research Council (MRC) Social Medicine Research Unit in 1948 and started the research which was to throw much light on the causation of coronary heart disease. Archie Cochrane was responsible for many important developments in epidemiological methods and knowledge and Donald Reid developed methods of epidemiological research in the field of mental disease. John Brotherston became the Chief Medical Officer in Scotland. By the end of the 1940s there were two main growing points in social medicine. Firstly there were the new university departments, mainly outside London, which were creating courses in social medicine in the undergraduate medical curriculum. The staff of these consisted usually of the professor and a senior lecturer and one or two research assistants. The courses were linked where possible to the clinical course and at the same time the department was probably embarking on research in the shape of a medical social survey. The second important growing point, discussed above, was represented by the group of doctors at the LSHTM who were starting important research in the field of non-communicable disease at the end of the 1940s. The MRC played a significant part in these developments by creating several research units which proved to be of great importance in advancing epidemiology. In addition to Morris’s Social Medicine Research Unit, 1948, it created the Pneumoconiosis Research Unit, 1945 (director, Charles Fletcher), the Statistical Research Unit, 1945 (first directed by Bradford Hill and then, in 1961, by Richard Doll) and the Epidemiological Unit, South Wales, 1962 (director, Archie Cochrane). In the 1950s some of us went to the USA for further experience. At the New York Hospital I met a young physician, Harold Willard, who had become interested in what happened to his patients after they left hospital. We had both done some modest research and teaching on the social aspects of clinical medicine but found that we were ignorant about what was going on in academic social medicine and epidemiology elsewhere, even in our own countries. To try and remedy this we decided to organise an International Corresponding Club (ICC) for those working in this field. Membership was restricted to medically qualified non-heads of the appropriate university departments or research institutes and we exchanged information by way of a twice yearly bulletin. (We excluded heads of departments because we thought that they would cramp our style). The first number of the Bulletin appeared in January 1955 and contained contributions from 26 correspondents in nine countries. We soon found that written communications were not enough and decided to organise a meeting of correspondents in London. The Ciba Foundation agreed to support a small meeting and this took place at the Foundation’s headquarters at 41 Portland Place on June 30 and July 1 1956. Twenty correspondents and nine invited visitors attended. (Appendix 2) By this time we had abolished the rule limiting membership to non-heads of departments because several of our members had become heads! When James Mackintosh put this motion to the meeting Jerry Jessop, Prof. of Social Medicine at Trinity College Dublin, called out from the back of the room “Do you mind omitting the word British?” After a moment of stunned silence there was a general murmur of “Agreed”. So the new society became The Society for Social Medicine and it has enjoyed and benefited from its inclusion of members from the Republic of Ireland ever since. A steering committee of five was elected at the meeting. The steering committee had been given powers of co-option and on the following afternoon it co-opted Richard Doll. At the final session of the London meeting a discussion on International Aspects took place and it was decided to accept the invitation of Prof A Querido to hold an international study group in the Netherlands in 1957. 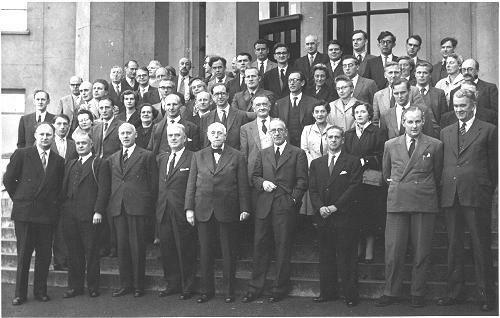 This meeting was held as planned and became the first international scientific meeting of the organisation which later became The International Epidemiological Association (IEA) (See IEA website for history and photo). The first scientific meeting of the Society for Social Medicine took place in Birmingham at the end of September 1957 and that of the IEA in Noordwijk, on the Dutch coast, at the beginning of the same month. From the beginning, membership of the Society for Social Medicine was offered to those, not necessarily medically qualified, who held academic or research posts in social medicine. Early non-medical members who contributed much to the Society included Prof Margot Jefferys, Dr Ann Cartwright and Mrs Vera Carstairs. Medical Officers of Health and their deputies or assistants were only offered membership if they had carried out research in social medicine. It was felt that if membership had been thrown open to all who were working in the field of public health that the Society might have become unbalanced in that direction. By 1973 the conditions of membership had been widened and simply stated that “Membership of the Society shall be open to all those who contribute to the objectives of the Society”. When the society was founded there were already some distinguished clinicians who had recognised the important contributions that social medicine and epidemiology could make, and was making, to their branches of medicine. These included Sir George Pickering, Regius Professor of Medicine in Oxford and Melville Arnott, Professor of Medicine in Birmingham. Sir Aubrey Lewis, Professor of Psychiatry and head of the Maudsley Institute, London, was an early member and attended several of the scientific meetings. Will Pickles, the Yorkshire general practitioner who had carried out some remarkable research on infectious diseases in his Wensleydale practice and later became the first president of the College (later Royal College) of General Practitioners, was a founder member. Other early members, distinguished in their own fields, included Lancelot Hogben, Lionel Penrose and Jack Tizard. The strength and influence of the Society from an early stage was probably increased by having distinguished representatives from a variety of disciplines other than medicine. The first annual scientific meeting of the Society was organised by the Department of Social Medicine of Birmingham University with Prof Tom McKeown in the chair. The second was in Trinity College, Dublin, with Prof WJE Jessop, in the chair (Photo). Subsequent meetings are listed in Table 1 in SSM Information. Formal links between the Society and the British Journal of Preventive and Social Medicine, (later to become The Journal of Epidemiology and Community Health), were established in 1959 and two representatives of the Society were added to the editorial board. Titles of papers to be read at the annual scientific meetings were published in the journal and in 1962 fuller accounts of the Society’s proceedings and abstracts of papers, given at the scientific meetings, were included. It is to be hoped that someone, better qualified than I am, will write a fuller history of the later years of the Society. 2 In the year I qualified, 1936, there were 28,268 deaths from tuberculosis in England and Wales. 3 Aphorisms of F.A.E.Crew. “The House of Commons is the pharmacy of Social Medicine” and “Man is the greatest pathogen known to man”. Orr JE. Food, Health and Income. London: Macmillan 1936. Pemberton J. Malnutrition in England. University College Hospital Magazine 1934;19(4):153-159. Committee against Malnutrition, Medical News. Lancet 1938;l:527. Stewart J. The Battle for Health. A political history of the Socialist Medical Association, 1930-51. Ashgate Publishing Limited, 1999. Royal College of Physicians of London.Social and Preventive Medicine Committee Interim Report Oct.1943. Leck I. The Society for Social Medicine; I956-1996. Journal of Epidemiology and Community Health 1996:50:177.